It’s hard to believe that June is passing by so quickly. In upstate New York, summer is in full force: barbecues, picnics, pool parties, evening concerts. Like a lot of families, we’re thinking about our summer travel plans and looking forward to the guests that will be visiting us during the next couple months. When you’re unpacking your bags, ready to relax with family at the beach or mingle with friends at a summer wedding, there’s one more thing that parents should think about: storing medication safely. There’s still a week left in June, which is National Safety Month. The CDC, along with the PROTECT Initiative, of which the CHPA Educational Foundation is a member, is encouraging parents to learn about the #MedsUpAway program. Did you know that 80% of emergency room visits for children among kids under 12 for medication overdoses are due to unsupervised children who take medication on their own? Please click on the infographic to view it full size. Even when we travel or host guests in our homes during the summer, it’s critical to remember that kids are still kids. They are curious about everything. They are always resourceful. Medications that help families stay healthy and safe can quickly become dangerous when they’re not stored up and away. If you’re going away this summer, remember to remove medication from your luggage once you arrive at your destination and put it in a safe place. If you’re staying with a friend or family member, or if they’re staying at your home, remind them that all medication should be out of the reach of children. Here are a few more tips for parents to help them remember to take their medication… without keeping that medication within reach or in view of children. 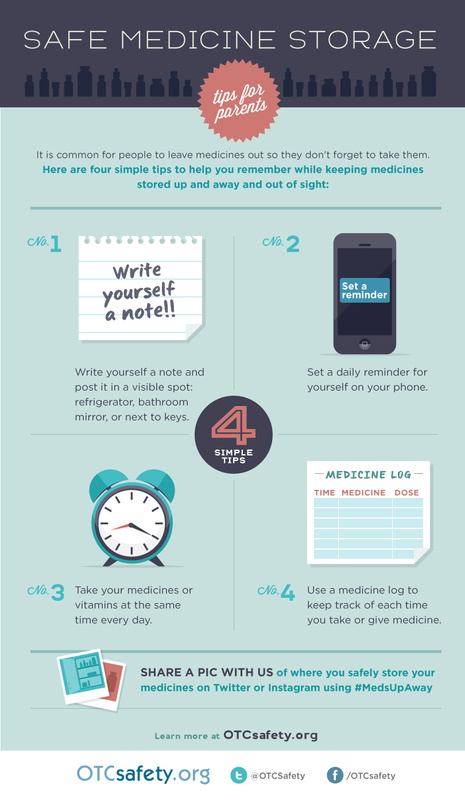 Do you have any other tips for remembering to take medication, while also keeping it up and away? For more information, please visit OTCSafety and follow us on Facebook or on Twitter. Disclosure: I receive compensation as part of the CHPA OTC Safety Ambassador Program. All the opinions reflected here are my own. Jessica recently posted…It’s My SITS Day! Welcome to School of Smock!